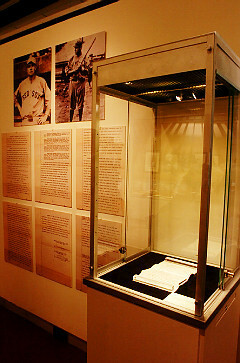 On December 26, 1919, Frazee sold Ruth to the New York Yankees. Popular legend has it that Frazee sold Ruth and several other of his best players to finance a Broadway play, No, No, Nanette (which actually didn't debut until 1925). The truth is somewhat more nuanced. After the 1919 season, Ruth demanded a raise to $20,000 ($212,733 in current dollar terms)—double his previous salary. However, Frazee refused, and Ruth responded by letting it be known he wouldn't play until he got his raise, suggesting that he may retire to undertake other profitable ventures. He'd actually jumped the team several times, including the last game of the 1919 season. Frazee finally lost patience with Ruth, and decided to trade him. However, he was effectively limited to two trading partners—the Chicago White Sox and the then-moribund Yankees. The other five clubs rejected his deals out of hand under pressure from American League president Ban Johnson, who never liked Frazee and was actively trying to remove him from ownership of the Red Sox. The White Sox offered Shoeless Joe Jackson and $60,000 ($638,200 in current dollar terms), but Yankees owners Jacob Ruppert and Tillinghast L'Hommedieu Huston offered an all-cash deal—$100,000 ($1,063,667 in current dollar terms). Frazee, Ruppert and Huston quickly agreed to a deal. In exchange for Ruth, the Red Sox would get $125,000 in cash and three $25,000 notes payable every year at 6 percent interest. Ruppert and Huston also loaned Frazee $300,000, with the mortgage on Fenway Park as collateral. The deal was contingent on Ruth signing a new contract, which was quickly agreed to, and Ruth officially became property of the Yankees on December 26. The deal was announced ten days later. It also turns out that there was a solid basis for the No, No, Nanette story. As Leigh Montville discovered during research for his book, The Big Bam: The Life and Times of Babe Ruth (Random House, 2006, p. 161-164), No, No, Nanette had originated as a non-musical stage play called My Lady Friends, which opened on Broadway in December 1919. His research indicated that that play had, indeed, been financed as a direct result of the Ruth sale to the Yankees. 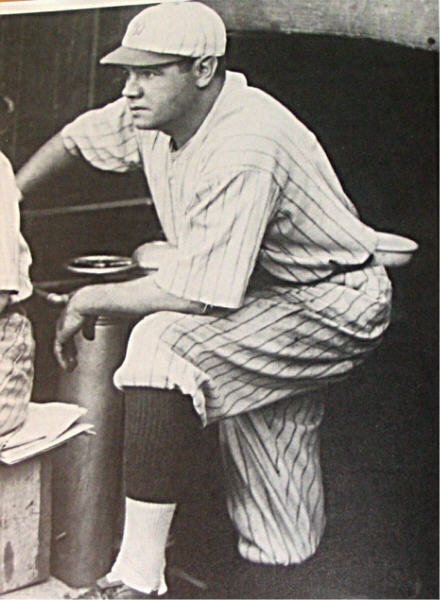 To bankroll his Broadway ventures, Boston owner Harry Frazee sold Ruth to the Yankees prior to the 1920 season for $100,000, twice the highest price previously paid for a player. (Frazee also got a $300,000 loan.) Ruth responded by shattering his home run record with 54, and went on to break his own record twice more with 59 in 1921 and 60 in 1927. The sale initiated the enduring rivalry between the two teams and shifted the balance of American League power from Boston to New York. Whereas the Red Sox had won six pennants and five World Series in the American League's first nineteen seasons, the Yankees, who had never won a pennant, would rule in the 1920s and 1930s and win fourteen flags before the Red Sox would clinch another. n the Yankees’ first 17 seasons, they finished better than fourth four times. In the next 20 seasons, the club won 11 American League pennants and eight World Series. If you want to argue that the entire course of franchise history wasn’t radically altered on Dec. 26, 1919, go ahead. Just don’t try to convince Red Sox fans, who waited forever to win a World Series after Red Sox owner Harry Frazee dealt Babe Ruth to the Bronx as if he had all the value of a pork belly future. “Obviously if Frazee had known what Ruth was going to do in New York, he probably wouldn’t have done it,” says Gabriel Schecter, a researcher at the Baseball Hall of Fame. Much more than a baseball man, Frazee was an entrepreneur who viewed his team the same way he looked at his Broadway productions: as a revenue stream. Frazee had sold off talent before — in 1916, he sent his best player, Tris Speaker, to the Cleveland Indians — and still the Red Sox kept winning World Series. Why would it be any different this time? Ruth may have been the greatest two-way talent in the game, but he was becoming increasingly incorrigible, grousing about money (he wanted his $10,000 salary doubled), bailing out on the final game of the 1919 season to appear in a pay-for-play exhibition game and doing his customary carousing. According to Yankees Century (Houghton Mifflin), by Glenn Stout, Frazee wasn’t driven to sell Ruth nearly as much by financial trouble in his theatrical productions as he was by Ruth’s indiscretions — and his chance for a large payday. The White Sox offered Frazee Shoeless Joe Jackson and $60,000 for Ruth, but Frazee was convinced the Yankees, tired of being the city’s second-string act behind the Giants — would dig deeper. In the ensuing three years, Frazee would deal the bulk of the Red Sox pitching staff — Waite Hoyt, Sam Jones, Joe Bush, Herb Pennock and George Pipgras — to the Yankees. But it was the sale of Ruth that proved competitively fatal. Yankee owners Jacob Ruppert and Tillinghast L’Hommedieu Huston paid $100,000 for Ruth, double the amount ever spent on a ballplayer. The total consisted of $25,000 in cash and three additional $25,000 notes. In addition, the Yankees loaned Frazee $300,000, the mortgage on Fenway Park serving as collateral. In his last year in Fenway, Ruth had the greatest power hitting performance to date, batting .322 with 29 homers and 114 RBI. He did not start auspiciously in New York, playing center field and dropping a deep fly to center to lose the opener, and not hitting a homer until May 1 — when he blasted a ball over the right-field roof of the Polo Grounds. By year’s end, though, Ruth’s numbers were staggering: a .376 average, 54 home runs, 137 RBI and a slugging percentage of .847. The Yankees more than doubled their attendance, to a record 1.3 million. The first of 26 world championships would come three years later, in 1923. Harry Frazee’s Red Sox? They finished last, 61-91, 37 games out of first place. Turns out that Babe Ruth was not Tris Speaker, or anybody else.